Hanoi (VNA) - Increased merger and acquisition (M&A) activities can spur infrastructure development in Vietnam, a current growth imperative, Planning and Investment Minister Nguyen Chi Dung said on August 10. He told an M&A forum in Hanoi that the sector has entered a new chapter in the 2014 to 2018 period, riding what experts have called the second wave of investment. The capital inflow from foreign investors during this period is expected to reach 20 billion USD, 25 percent of which could happen this year. This is largely driven by equitisation commitments of major State owned enterprises, the rise of private sector and steady investment from foreign economic entities. The Ministry of Planning and Investment (MPI) has concluded that in order to catalyse growth, investment in the form of M&As in the infrastructure sector needs to increase and expand across many branches of the economy. The projects would include upgrading roads, railways, airports and seaports to global standards, as well as establishing a stable network of real estate and retail conglomerates. Prime Minister Nguyen Xuan Phuc also emphasised this during his official visit to the US and Japan last June, informing hosts that Vietnam was pushing for M&A activities involving divestments in key sectors of the economy such as construction, retail, tourism or communications by State owned enterprises. 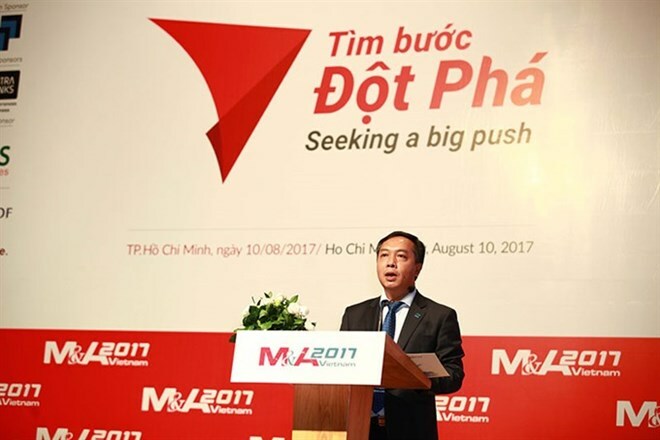 Le Trong Minh, Editor in Chief of the Vietnam Investment Review (VIR) and head of the forum’s organising committee, said he was hopeful that as more and more major enterprises’ make initial public offerings, State divestments increase and administrative policy frameworks are geared towards accommodating foreign investors, the future of M&A sector is bright. M&A deals in Vietnam hit an all-time high of 5.8 billion USD in 2016, a growth of 11.92 percent from 2015, according to a report released at the press conference last month announcing the 2017 Vietnam M&A Forum. The retail and real estate sectors were the most attractive areas for M&A activities in 2016. Tran Vinh Du, Deputy Director of M&A Counselling at Ernst and Young Vietnam, said that the period between 2017 and 2018 would be optimal for foreign enterprises and funds to divest, spurring M&A activities. These units have been present in Vietnam before 2010, purchasing large stakes for low prices during the 2010 economic stagnancy. However, the market has experienced a slowdown since the latter half of 2016 with fewer stellar deals. And the total value of M&A deals was just 1.1 billion USD in the first quarter this year, down 24.4 percent from last year. As such, the Vietnamese M&A market would most likely not surpass 2016’s peak without an extra surge from foreign investors, especially in the real estate and retail sectors. The M&A trend in the real estates and retail sectors is expected to intensify in the remaining months of this year, with the participation of foreign investors, mainly from Japan, Hong Kong, the Republic of Korea, Thailand and Singapore. At the end of June 2017, Japanese Hankyu Hanshin Holdings Inc met with the Ho Chi Minh City Real Estate Association (HoREA) to discuss the former’s involvement in 197 projects in the form of private public partnerships and 120 other key national real estate projects in need of investment within HCM City alone. This is seen as a spark that could light up country’s M&A sector, as Japanese investors rarely get involved in unstable deals. Numerous Vietnamese real estate enterprises like Vingroup, Sun Group, FLC, Bitexco and Novaland have successfully concluded M&A deals over the past five years. The sector has seen hundreds of private M&A deals as well as real estate development projects worth billions of dollars. From 2014 to 2015 alone, Vingroup spent 1 billion USD acquiring other enterprises and projects in the market, extending their operations into retail, agriculture, education, and construction materials via M&A deals. In the retail sector, another deal that attracted much public attention in late 2016 was the purchase of 78.38 million shares of the Vietnam Dairy Products Joint Stock Company (Vinamilk) by Singaporean food and beverage firm Fraser & Neave (F&N) at 11.3 trillion VND (over 500 million USD). Another large M&A deal in 2016 was Thai group Singha becoming a strategic partner of Masan Group by buying 25 percent and 33 percent stakes in Masan Consumer Holdings and Masan Brewery, respectively, at 1.1 billion USD. Dang Xuan Minh, head of the Vietnam M&A Forum’s research group, said that retail and consumer goods M&A targeted at entering and expanding the market was the most noteworthy trend in 2016. According to the group, M&A value in 2016 broke the record of 5.2 billion USD set the previous year. The number of foreign retailers entering Vietnam and the opening of foreign-owned retail outlets through M&As had increased over the last three years, Minh said. Even though Vietnam M&A market value is small in comparison with other ASEAN countries such as Singapore (62.3 billion USD in 2016); Indonesia, Thailand and Malaysia (11 USD to 16 billion USD on average), the country has an advantage in terms of its dynamism, according to Duong Thuy Dung, Senior Director, National Head of Professional Services at CBRE Vietnam. Dung explained that with the Vietnamese government on board with M&A growth, the market could see more foreign investors looking to partner with domestic firms. The annual M&A Forum, in its ninth edition, is one of the most prestigious meeting grounds for investors interested in mergers and acquisitions in the country and abroad. It helps connect domestic businesses with foreign investors and firms for better investment opportunities and development.